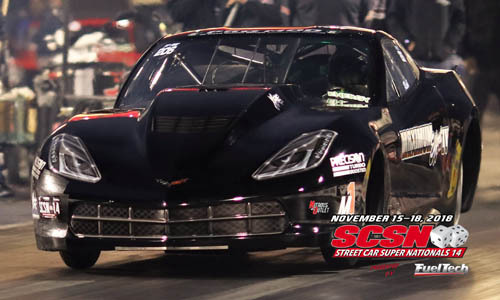 LAS VEGAS - With the sun down and the temps growing cooler, Rick Hord continued his march to the Precision Turbo Pro Mod top qualifier Friday at the Nitro Outlet Street Car Super Nationals 14 Presented by FuelTech. The Florida native used his last pass to drop a lap of 5.587 seconds at 263.25 mph. Nipping at his heels at The Strip at Las Vegas Motor Speedway is Ed Thornton, whose 5.613-second run put him solidly in second, but it was his 270.10 mph speed providing fair warning to Hord that starting P1 Sunday isn't a given. Hord has an ace in his pocket, however, one he showed Thursday night. First up in the Pro Mod Shootout, an exhibition race featuring a $1,000 payday and an incredible trophy designed and built by Chad Reynolds of Bangshift.com, Hord destroyed the field with a 5.524-second lap. From there, it was a matter of watching the rest of the pack fail to come near his ET. The highlight of Friday's on-track action was a 4-Wide grudge match with two radial cars and two small-tire cars. 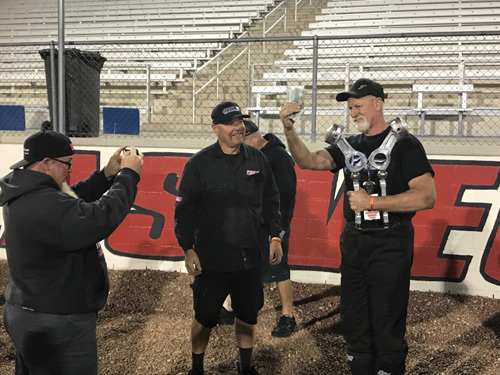 Ten large was on the line in a contest between Giuseppe Gentile, Mark Woodruff, Eric Kvilhaug, and Jay Boddie. With the scoreboards dark, all four launched into SCSN history, Gentile earning bragging rights and $10,000. There will be more on this story this weekend at DragIllustrated.com. "It's been another wild day at the Street Car Super Nationals," said event promoter Mel Roth. "We've experienced a couple slowdowns, but thanks to having the other two lanes prepped for the next class, we've been able to speed things along. We have so many fast cars on the property right now and a lot of drivers just waiting for their chance. We've seen before that the driver leading the class the whole weekend may not even make the finals. "The weather is awesome and as always, the track has given us a spectacular track." For more information on the Nitrous Outlet Street Car Super Nationals 14 Presented by FuelTech, visit StreetCarSuperNationals.com, or the official event page on Facebook by clicking HERE.